There's so much new stuff on Poptropica Worlds! +New decorations in your house! +New costumes in the shop -- the long-awaited winners of the costume contest! 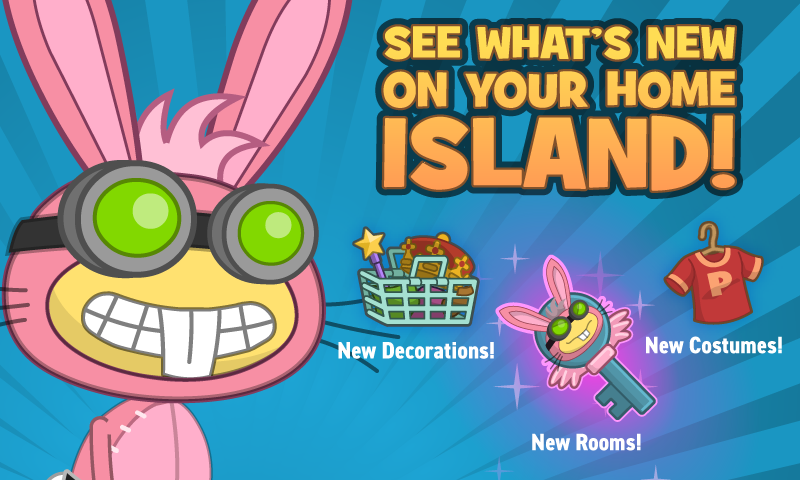 +For Members, a brand-new room, featuring all Dr. Hare-themed decorations! We've also added a new ending to Dr. Hare's Revenge. If you've been wondering where that pink-suited meanie has been hiding this whole time, collect all the carrots in Dr. Hare's Revenge to find out. This update is available everywhere you play Poptropica Worlds. So update now and dive back in! Legendary Swords -- now available to all! Heads up: Legendary Swords is now open to all on Poptropica Original! Get on over to www.poptropica.com and start slashing your way through E.Vile's robot army! Legendary Swords is BACK, and it's only on Poptropica Original! Choose your weapon and get ready to hack-n-slash your way through Dr. E. Vile's army of angry robots. Explore a bizarre alien world full of strange creatures and weird vegetation. Fight massive bosses. Become a legend! Legendary Swords is accessible from the Poptropica map and is open to Poptropica Members. Play Legendary Swords now on Poptropica Original! It's the Thanksgiving holiday once again in these here United States, so the Poptropica Creators are taking a well-earned break to gorge ourselves on various fowl, root vegetables, and buttered rolls. A normal Thursday, in other words, except we don't have to work. We are thankful to all of the longtime Poptropica fans who have stuck with us through thick and thin, and to new players who are just discovering what awaits them in both Poptropica Original and Poptropica Worlds. You're the best! Remember you have through this weekend to find the three new followers on Poptropica Original. Just like Thanksgiving leftovers, they'll be gone by Monday! Three new followers on Poptropica Original -- limited time only! We've got ourselves a dilly of a pickle on Poptropica Original. We made three new Thanksgiving-themed followers to give away to our players -- but they all ran away! Here's what we know: they're all hiding on Main Streets somewhere within the Poptropica Original website. If you see one, just give 'em a click and they'll be added to your inventory. Sweet Tato, Cran Barry, and Punkie Pie are all waiting for you to give them a good home. Find them, and they'll follow you wherever you go. But you've got to act fast! Like Thanksgiving itself, these guys will only be around for a short time. Don't miss your chance to grab these three-of-a-kind followers. They'll be gone when the holiday is. Find them on the Poptropica Original website now!